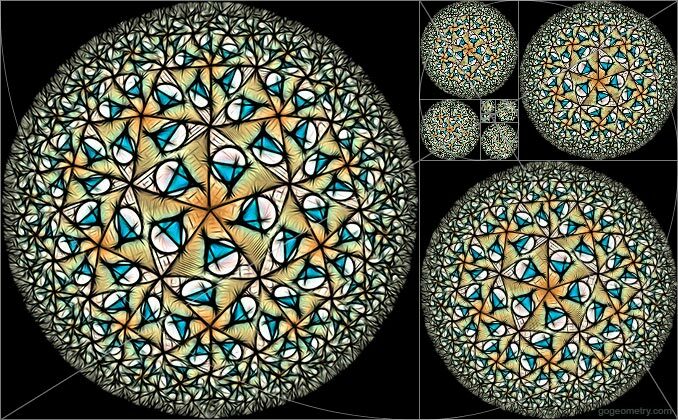 Geometric Art: Kaleidoscope of Geometry Problem 760 based on Poincare Disk Model. Golden Rectangle. The Poincaré disk model is a model of n-dimensional hyperbolic geometry in which the points of the geometry are in an n-dimensional disk, or unit ball, and the straight lines consist of all segments of circles contained within the disk that are orthogonal to the boundary of the disk, plus all diameters of the disk.